The Value Of Cheerfulness: double dates, singing in the rain, berry picking parties, and get out the vote! double dates, singing in the rain, berry picking parties, and get out the vote! The date...the date was so blissful and it was compliments of this sweet friend, as a thank you for those three little quilts. After my buff, rugged and gorgeous date had shaved and put on his cologne and after I donned high heels and a dress that I just been waiting for an occasion to wear, not that it would have had to have been an " occasion " per say I could have gone out exactly as I was in capris a tee shirt and flip flops, no one one have known the difference...but I decided that day that sometimes you have to make your own occasions if you want a good reason to wear a pretty dress with heels. So I did. After all that we went to a little Italian restaurant/pie shop nearby where dinner was fabulous and the company, even more so. I mean you can't beat that combination. And you better believe we ordered dessert. We laughed and chatted, hand in hand and remarked how nice and relaxed it felt not to have to be fishing our two year old who gets called Monkey by her father more than she does her given name, out from under the table every few minutes. Meanwhile at home, with not just one but two literally Great Aunts ( David's Mom's Sisters ) Annabelle was having a ball. When we got home Aunt Lynne told us " boy is she ever a going concern." Which I think meant, she was very good and very busy and kept them quite entertained in true Annabelle-like fashion. Which means lots of facial expressions, excitement, occasional acrobatic feats and an endless list of other funny little antics. After dinner we decided we'd like to enjoy what you could say is our version of a double date: mostly meaning two dates in one night, so we headed over to Starbucks and parked ourselves for another hour where I got my wish to sit with my knees up in a big overstuffed chair and flirt with my boyfriend. Well we went between flirting to trying to concentrate on the list we were making...plotting out our future, or what David has begun to refer to as our "exit strategy." The exit stragety inclueds the end of his current job, the sale of our current home sweet home and leaving the area we live in...and it involves jumping into much anticipated on my part anyway, yet uncharted waters for us. As he prayed tonight at the table " Lord, please guide us and show us where we need to go and what we should do. And help me to be brave. " It's a big deal this striking out on our own. Especially since we don't know where exactly we are going or whether any of our ideas for owning our own business will make enough money to sustain us. I am beyond excited about the unknowns in our future, but then I am not the one responsible for providing for us either. Seeing it through, David's eyes, I understand the prayer for courage. After all he is giving up his perfectly good job for we aren't even sure what yet. The one thing we are certain of is that we want to be closer to our family. After this coming weekend, it will have been my 10 th trip to ID since Mothers day. And that cannot go on forever. But then there was the flirting. Lots and lots of flirting. And then we ran into the grocery store for chocolate covered gummy bears, and a couple bouquets of roses which we had decided to "pay" the aunts with. As we walked out of the store we were amazed, finding ourselves under a most amazing sky, of deep cobalt blue. It was dusk and even the clouds looked as if they had been dipped in buckets of indigo blue paint. Neither of us had ever seen anything quite like it. And I rather think it was one of those although far from significant, precious little moments that you just know you won't forget and will always be able to pull up a visual for, in your minds eye. The kind of moment you would have completely missed if you had been rushing out of the grocery store, juggling babies and a shopping cart, rushing home, instead of strolling out starry eyed, on the arm of the one you love. He had me in stitches all the way home. It was so refreshing to get to be a little bit care free and enjoy the romance that often gets overshadowed by the sweet little interruptions of daily life. And knowing that Annabelle was being read to, and loved on by such dear babysitters was a really good feeling too.. I mean really, how many of you were lucky enough to have two great aunts dote on you and spoil and give you their sole attention for three entire hours at a time, repeatedly? Truly, as happy as she was to see us, she didn't even miss us one little bit. And I can almost say the same about her.
" Mommy I want to go outside and play with your ******** (insert a word here that I can not for the life of me decipher ) after over a dozen "say it again honey" I asked her if she could show me what she meant. She took my hand and lead me to the coat closet, I opened the door, in she goes to pull out my yellow umbrella. " Mommy want to go out in a muddle puddle and go? (demonstrating) " stomp! stomp! That be fun? " Well of course I do. 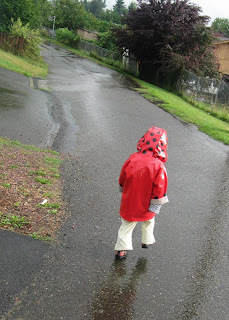 I am always looking for a good reason to dress her in her beloved hand-me -down ladybug raincoat and wellies. In other news, our blackberries are ripe. But there is no way I can possibly get all of them picked before they spoil or fit that many gallons in my teeny tiny freezer...so consider yourself invited to a berry picking party at my house. Any time in the next month, open invitation. Come and get your fingers purple with us! My dear friend Dawna is a semi-finalist in a recipe contest over at Saucy Eats that I really want her to win. Not only that but she is amazing and just plain old deserves to win. Just this once, there is no hesitation in deciding who to vote for. So if you get a chance could you pop in there and give her your vote. Also you can read the super darling post she wrote up about her Top Secret Recipe here. And please if you think about it, she could really use your prayers today. Oh, Chelle! Every time I read a post from your sweet, little life, it always seems to bless me in the way that you show such a carefree spirit for just every day life. You are truly an inspiring person. I hope that God blesses you and your family in every little way and all the doors that you open I hope bring nothing but success and happiness for you! And you painted a perfect picture of your most romantic date and it sounds dream-like! Love and Blessings to your sweet family Chelle! Whoo hoo! To live with hours of you instead of MANY hours would be soooo nice! I often wake up just in-the-mood for a run to Chelles place to enjoy her company and maybe a cup of coffee, and if we are real naughty, some of those dark chocolate m&ms stashed in the "you-know-where". I miss you, I miss your friendship as a close in proxemity. And I MISS you coming over and ENJOYING the trip, poor thing, there is NO way you can enjoy trips over if they are practicaly every other week-end! SOOON it is my turn for a visit. Would you be ready for crazy? 'Cauz it is crazy when we come! P.S. Has it really been since the time when I made that "party dress"? Seriously?? And where is the photo of that dress which you make look beautiful, for with out you dearest of Chelles, it would just be "dress". I'm so glad your date night went well and David is finally taking that next big exciting step. Good for him! I love Annabelle's purple lips. How could anyone resist her? 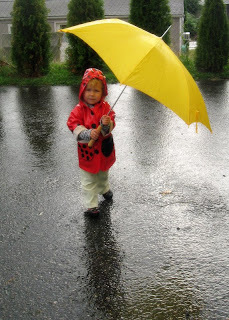 :) She looks like she's having a blast jumping in puddles with her mommy's bright cheerful umbrella. Life is so good Chelle, and we are so blessed. Hugs to you dear friend. good luck with your "exit strategy". (kudos to david on his phrasing, BTW. love it.) that's wonderful and exciting. and if you get closer, i warn you, i'll expect to actually see you face-to-face occasionally! this sounds like an amazing time in your life... revel! I would be the in a heart beat to pick berries with you girls - in a heart beat!!! oh how i wish we could just drop by and get our fingers all purple. and how elizabeth would love to get in the muddle puddle with annabelle...such sweet moments...such a true and right outlook on life...beautiful! Aww! Sounds like a fun date! Can't wait until my man is back so we can go on dates again. ohh my send me some of those blackberries!!!! i love them! and this pretty little one! she is too sweet! I am so excited for you and your husband and what your future is going to hold. It is so wide open, it sounds absolutely wonderful! How terrific that you got to spend such a sweet day together. I love when that happens and when Michael and I can go back, but for a moment, to the way we were. We love being parents, but we love being just lovers too! Oh, and the thing I miss most about Seattle would have to be the blackberries. I have never seen so many in all my life! In the fall I would just pick and pick and pick. And put them in everything, oh, how I miss that!! so I dreamed right along with you in that post...and could even taste the berries in the end! I would LOVE to be enjoying those berries with you girls!!! 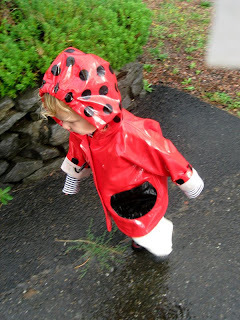 I'm not sure which I love more, the little girl in the ladybug slicker playing in the muddle puddles, or that sweet little girl with the berry-stained mouth. I do have a soft spot for that borrowed niece of mine! So glad you had a wonderful evening out with David, and I like your definition of double date! Please keep us posted on your exciting new venture so we can pray along with you. 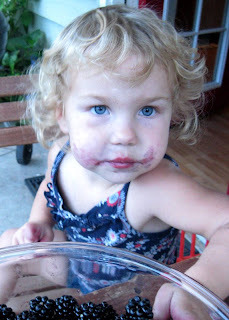 Oh, and I forgot to tell you that I especially love the pictures of her with blackberry stained lips and cheeks! LOVE YOU! I read this post this morning after I had just prayed for you...for God's guidance for your future. 03. And business plans? You must fill me in! 05. 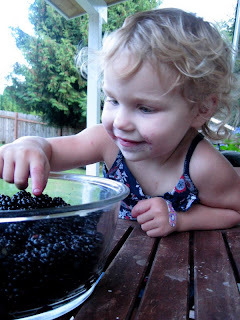 Speaking of blackberries, I really wish we could pick some with you guys- you truly do have more than enough to spare! ps. We so have the exact same music taste! I love it I've just had your blog open for over half an hour just listening to your playlist. I LOVE that you love the weepies and the juno sountrack and Leigh Nash and the song 'Homebird'and Feist and and and! And I am loving 'Lucky' by Jason Mraz too - adding it to my favs. pps. Your little one is so cute! love the blueberrys all over her face. Hi- I wandered over here from Tales from a Crafty Mama. I just thought I would tell you that your music selection was inspiring to me today. I just left your blog open while it played its music and then went back to my blog to write today's entry. Thanks for a little chill in my afternoon. ahhhh! My, you girls have been busy, as usual!, lately. David is a doll and you three make the most beautiful family. I'll be praying for lots of "courage" and lots of direction as you guys prepare to change course. I have nothing but faith that Jesus is going to bless you immensely! And my dear, how you keep up with your precious little one is beyond me. She's a mover!